Is the family's financial blueprint mapped for success? Is the family planning to leave a legacy of abundance? Is the family's wealth calamity proof? Can team-building work for the family business? These are the questions that Premiere Business & Planning Inc. wants to answer with its upcoming 1st Family & Business Inheritance Conference here in Cebu on October 1. Premiere Business & Planning Inc puts together four great authors to give the best of promoting and empowering sustainability in Filipino family businesses. Jonathan Ramos, Premier Business President and a pioneer graduate of the US-based International Association of Registered Financial Consultancy. Maribel Dionisio, a family communication expert. “Family Communication: A Tool to Building Trust”. 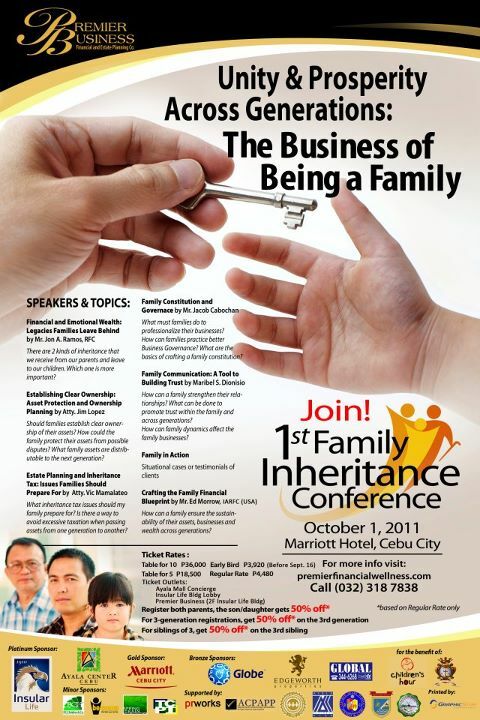 The 1st Family Inheritance Conference is supported by the Mandaue Chamber of Commerce and Industry, Ayala Business Club of Cebu Inc., Ateneo de Cebu, PAREF Southcrest, University of the Visayas, Association of Certified Public Accountants in Public Practice-Cebu Chapter (ACPAPP),Graphic Star, and PR Works. Sponsors include Insular Life, Ayala Center Cebu, Cebu City Marriott Hotel, Globe Telecom, Global Image, Edgeworth Properties, BCH, BE! Trainings, and Spring Rain Global Consultancy. Discounts will be given to early and group registrants. Conference Registration fee is P4, 480. For inquiries, please call (032) 318-7838 or visit http://www.premierfinancialwellness.com/. 0 comments: on "1st Family & Business Inheritance Conference in Cebu on Oct 1 at Marriott"